Seaweed crept across the deck until it oozed over Wabbit's feet. The spectres were on board and they didn't look happy. The ramp lifted and closed behind them. 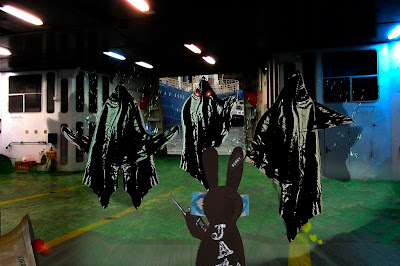 The Wabbit murmured into his walkie talkie and the Lepus shuddered as its engines fired. The spectres shed sea spray. The Wabbit kicked the bell and they froze for a moment. "Give up your souls!" yelled the Wabbit. He waved his walkie talkie at them. "And begone you hostile powers." A spectre spread oily arms wide. His voice was between a moan and a sneer. "Make us." The three spectres laughed and pointed and swore. The spectre at the back waved and shouted, "In your fur." Then the spectre at the front stepped forward, shook his ghastly head and clutched himself. "I need to go." A stream of yellow green liquid ran from his cloak onto the deck. Paint bubbled and burned. "Aha ha ha," gurgled the spectre, "that's better." The Wabbit stood his ground. The Lepus vibrated - she was underway, he could feel it. "We're taking you where you can do no harm." For the first time, the spectres seemed alarmed. They shifted uneasily and mumbled curses. They huddled together and spat on the deck. "We'll take your soul!" The Wabbit whacked the bell and yelled. "You'll have to find it first." Now they shrivelled down until their cloaks lay on the deck. "Pray," shouted the Wabbit, "The longer you delay, the heavier your punishment will be." How heavy?" whimpered a spectre." "Heavier than a bad breakfast," snapped the Wabbit.